A tower that pays tribute to traditional Arab architecture and that also has a very modern feel, with the best that today’s technology has to offer. This is what HAR properties had in mind when they created the AYA building, the first of which will be built in Beirut very soon. Philippe Tabet, General Manager of the newly established company explains that they wanted to offer something that is different from what’s currently available on the market. He adds “unfortunately, the real estate development of Arab countries does not reflect the values of Arab heritage and traditional architecture. There is a race for profit at the expense of roots and heritage”. Authenticity, aesthetics and quality living are at the center of the project designed by French architecture firm SOA… including the choice of name! The word “AYA” was approved by a Feng Shui master who also visited the site and recommended that the building be positioned perpendicular to the road, and that it faces east. That also allows all the apartments to have maximum sun exposure. Each unit remains an exclusive, individual cocoon. The apartments are inspired by the Majlis, Diwan, Patio tryptic. The unique checkerboard structure of AYA towers allows each apartment to have its own open terrace as the patios are not superposed. Each side of the tower is cut into three equal parts, for a total of 12 sequences. On each level, 2 of the 12 sequences go back 1 meter to form the open air terraces. The checkerboard structure follows these backsteps and supports the weight like a pyramid. The basic concept of AYA towers can be adapted to different urban setting with facades that can be executed in different versions: gold, black metal or concrete; and a design that places more emphasis on elegance rather than show-off. Tabet explains that they want to keep the pricing competitive for these apartments ranging from 150 square meters to double that size. 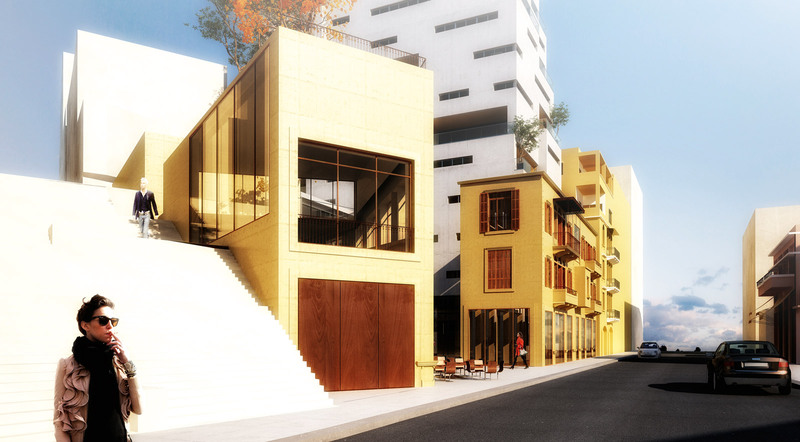 Construction for the first AYA tower in Beirut will start soon, expect completion by 2013. There will be 19 floors with 25 residential apartments, 1600 square meters of office space and 700 square meters for shops on the ground floor. After that, there are plans to build other AYA towers in Lebanese and Arab cities.